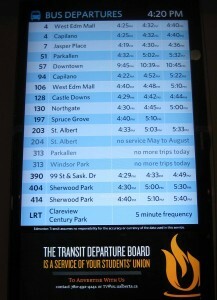 Yesterday, Gerry T shared a photo he snapped at the University of Alberta in Edmonton of a “departure board” in the university’s Student Union building that uses open transportation data from the city’s website. Essentially the display board is composed of a simply application, displayed over a large flat screen TV turned vertically. It’s exactly the kind of thing that I imagine University Students in many cities around the world wish they had – especially if you are on a campus that is cold and/or wet. Wouldn’t it be nice to wait inside that warm student union building rather than at the bus stop? Of course in Boston they’ve gone further than just providing the schedule online. 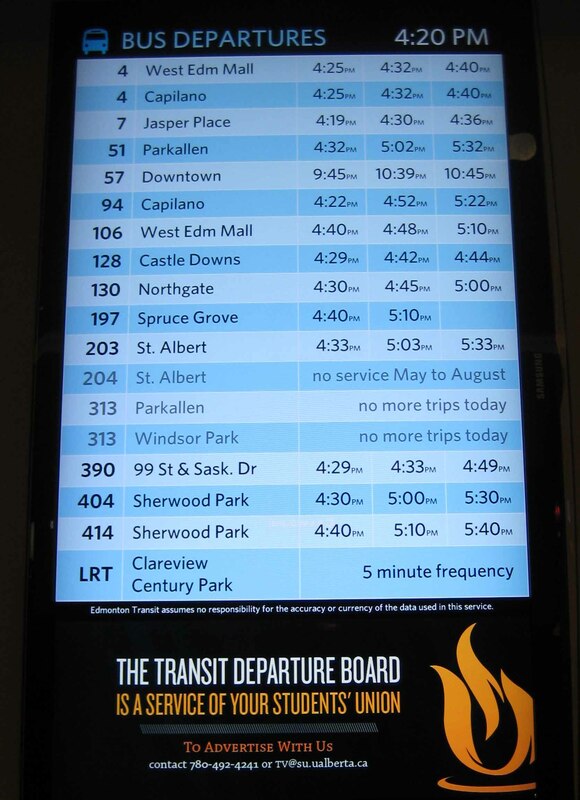 They provide real-time data on bus locations which some students and engineers have used to create $350 LED signs in coffee houses to let users know when the next bus is coming. It’s the kind of simple innovations you wish you’d see in more places: government’s letting people help themselves at making their lives a little easier. Yes, this isn’t changing the world, but its a start, and an example of what more could happen. Mostly it’s nice to see innovators in Canada like playing with the technology. Hopefully governments will catch up and let the even bigger ideas students around the country have be more than just visions in their heads. Not sure who at the University created this, but nice work. This entry was posted in open data, public policy, technology and tagged applications, opendata, technology, transit on May 18, 2011 by David Eaves. This was done by the Students’ Union at the UofA… and thanks for the feedback, we’re getting a lot of interest! This is – as you say – simply scheduled data, but once Edmonton Transit Services start providing GPS data, we’ll be there! For more details you can contact us via our main site at su.ualberta.ca. Cheers.